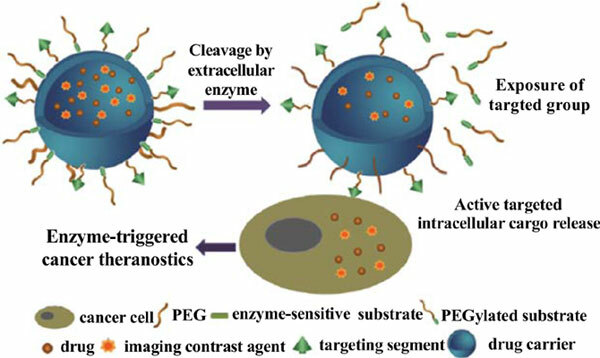 Enzymatic dysregulation in tumor and intracellular microenvironments has made this property a tremendously promising responsive element for efficient diagnostics, carrier targeting, and drug release. When combined with nanotechnology, enzyme-responsive drug delivery systems (DDSs) have achieved substantial advancements. In the first part of this tutorial review, changes in tumor and intracellular microenvironmental factors, particularly the enzymatic index, are described. Subsequently, the peptide sequences of various enzyme-triggered nanomaterials are summarized for their uses in various drug delivery applications. Then, some other enzyme responsive nanostructures are discussed. Finally, the future opportunities and challenges are discussed. In brief, this review can provide inspiration and impetus for exploiting more promising internal enzyme stimuli-responsive nanoDDSs for targeted tumor diagnosis and treatment. Keywords: Tumor microenvironment, Enzyme-responsive, Peptide, Sequence, Targeted drug delivery, DDSs. Keywords:Tumor microenvironment, Enzyme-responsive, Peptide, Sequence, Targeted drug delivery, DDSs. Abstract:Enzymatic dysregulation in tumor and intracellular microenvironments has made this property a tremendously promising responsive element for efficient diagnostics, carrier targeting, and drug release. When combined with nanotechnology, enzyme-responsive drug delivery systems (DDSs) have achieved substantial advancements. In the first part of this tutorial review, changes in tumor and intracellular microenvironmental factors, particularly the enzymatic index, are described. Subsequently, the peptide sequences of various enzyme-triggered nanomaterials are summarized for their uses in various drug delivery applications. Then, some other enzyme responsive nanostructures are discussed. Finally, the future opportunities and challenges are discussed. In brief, this review can provide inspiration and impetus for exploiting more promising internal enzyme stimuli-responsive nanoDDSs for targeted tumor diagnosis and treatment.